Stepper Music Box: Dual stepper motors plus two servo-driven percussion instruments, in a tidy project box #piday #raspberrypi @Raspberry_Pi « Adafruit Industries – Makers, hackers, artists, designers and engineers! 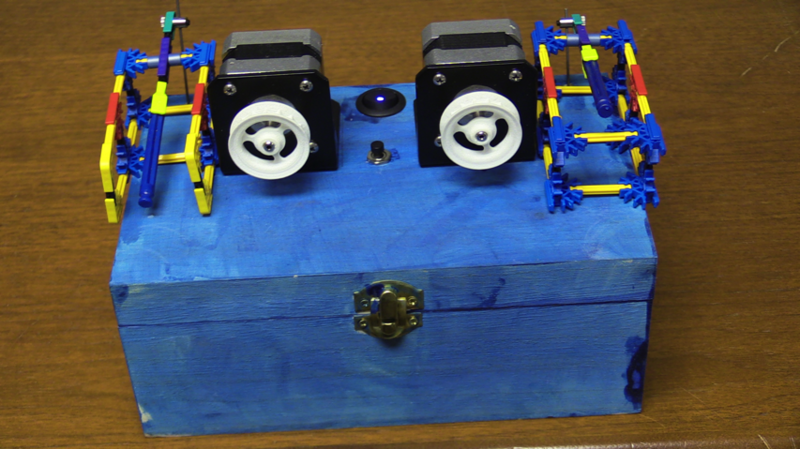 Jeremy shared his great music box project at hackaday.io. Via Hack a day. After seeing someone’s floppy-drive orchestra, I was inspired to reuse my stepper motors from another project. The music starts as a MIDI file, pre-processed in C# into a text file. The Raspberry Pi runs a Python script to watch the play/stop button and play out note data via serial to the Iteaduino Mega, with a Dual Stepper Shield to drive the two steppers and two servos. The fun part for me was putting it all in a wooden box, and trying out panel-mount components for the first time. There’s a power-switch where the LED lights up when a power source is connected, so I don’t leave a LiPo in it. There’s a play/stop button, and a barrel jack on the back for wall power. I even used the normal pin on the jack to disconnect the battery connector when a wall source is connected, so I can’t accidentally blow up a LiPo. I also built a little servo distribution board out of veroboard. Unfortunately that was inspired by melting one of my servos after reversing power and ground — building headers for the 3-pin connectors helped avoid that happening again. Thanks to Andrew Hunt for the loan of the recording equipment (Canon XA25 and EV RE20), and to Zach Horsley for the inspiration. 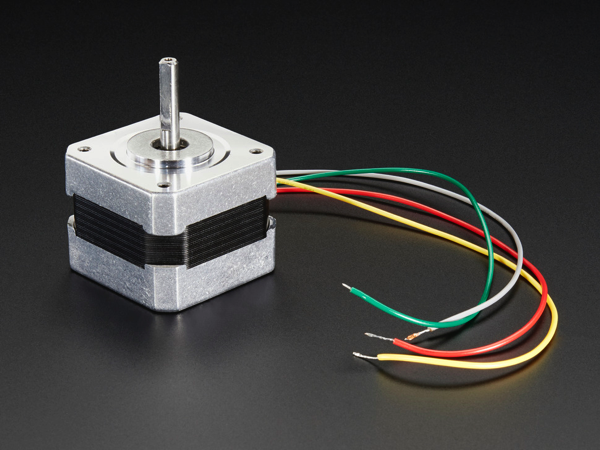 Stepper motor – NEMA-17 size – 200 steps/rev, 12V 350mA: A stepper motor to satisfy all your robotics needs! This 4-wire bipolar stepper has 1.8° per step for smooth motion and a nice holding torque. The motor was specified to have a max current of 350mA so that it could be driven easily with an Adafruit motor shield for Arduino (or other motor driver) and a wall adapter or lead-acid battery. Read more. 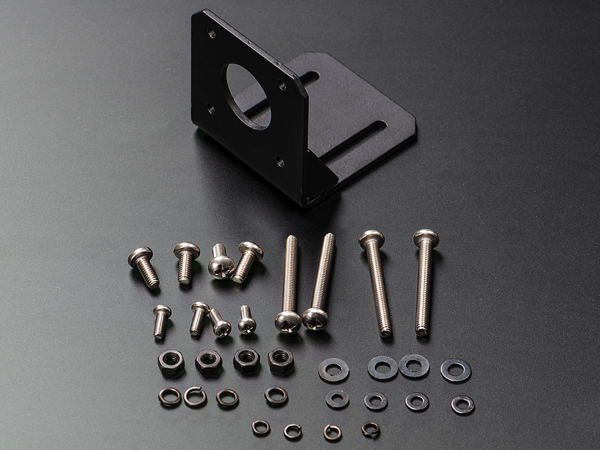 Stepper Motor Mount with Hardware – NEMA-17 Sized: You have a stepper motor, but you need to attach it to your CNC project, eh? Not so easy if you don’t have a stepper motor mount just like this fine one one here! This mount will fit any NEMA-17 motor (with 31mm hole spacing) with four screws. There’s two 30mm long slots, 30mm apart so you can easily attach it. Made of steel with welded 90-degree support triangles, its got a solid construction. Read more.